"You can't beat the 'old world' charm and craftsmanship of Patrick Lodge." Tucked away in Rothrock State Forest and up a private driveway past Camp Blue Diamond, Patrick Lodge is a private retreat. Featuring three bedrooms and two full baths, a family or group of friends can get together to enjoy nature and the quiet away from the hustle and bustle of everyday life. 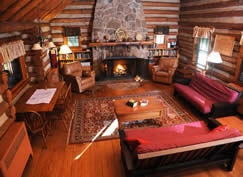 Nestled deep in the woods, Patrick Lodge offers you privacy and serenity. The great room features a large, unique, stone fireplace, ceiling fans and maximum seating space. A gorgeous staircase leads up to a bedroom with a private bath. A sun porch offers space for a meal or to relax and take a nap. 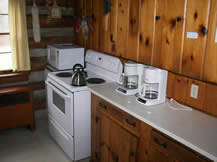 A newly updated kitchen and two baths make this rustic lodge an ideal retreat. Over the years, Patrick Lodge has housed numerous personal gatherings, club retreats and academic classes; sharing the beauty of Diamond Valley with the Juniata College community and guests. As Juniata encourages all of our students to explore the world they live in, we encourage you to enjoy Patrick Lodge and the area around it. There are plenty of outdoor activities to enjoy, as well as other local tourism activities and businesses. About thirty minutes from State College, Altoona and Huntingdon, Patrick Lodge is near the exact center of Pennsylvania, about seven miles Northeast of Petersburg. Click here to make a reservation, or contact Lorri Panaia Shideler at events@juniata.edu. From US 22 at Alexandria, PA take PA 305 East to Petersburg. At the main intersection in Petersburg, turn left (staying on PA 305). Travel .7 miles and turn left at intersection with sign for "Camp Blue Diamond". Travel .3 miles, cross a small bridge and turn left at the fork. Travel 1.2 miles and turn right onto the paved road at intersection with sign for "Diamond Valley-5". Travel on paved road 4.8 miles into Camp Blue Diamond and continue through the camp. You will pass a lake and see signs directing you to the "West" and "Patrick" Lodges. Follow the dirt road past the West Lodge and you will see Patrick Lodge to your right at the end of the dirt road. 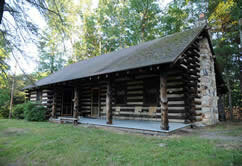 Patrick Lodge is available for use by Juniata College classes, student organizations, faculty, and staff, Juniata Alumni and visitors to the Huntingdon area. Student organizations must have the organization’s advisor email written approval of the event to the Office of Conferences & Events – events@juniata.edu prior to the event being approved. Check-in time is 2:00 p.m.
Check-out time is 10:00 a.m. The keys are to be picked up from the Conferences & Events Office. NOTE: Lodge must be reserved 48 hours prior to stay. Notice of cancellation must be made 24 hours prior to stay. 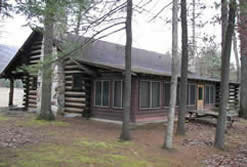 You will be charged for the lodge if cancellation notice is less than 24 hours. Failure to checkout at 10:00 a.m. will incur an additional day's fee for use of lodge. Upon arrival and departure, please check for any damages and report any issues to Lorri Shideler at the Camps, Conferences and Events Office at 641-3605 or email events@juniata.edu. No open flames/candles are permitted, except in the fireplace and grill. Return furniture to original configuration, if needed. Do not leave garbage outside or on the porch. Please remember you are in the forest where animals forage for garbage if it is not properly secured. For the safety of our guests, as well as those guests at other nearby lodges/cabins, Firearms are NOT permitted at the Lodge and the surrounding property. Maximum capacity for overnight is 10 guests. Firewood for outside fire pit and fireplace. Provided for your use are a few dishes, pots, pans and miscellaneous utensils. We will make an effort to keep firewood supplied for your use, but firewood is not guaranteed to be available. A wheelbarrow is available for transporting the firewood, if needed. Please do not remove firewood from other locations. Trash bags, toilet tissue, and cleaning supplies are available in the supply closet. If it rings, DO NOT assume a fire alarm to be a false alarm. Check it out. The keypad will tell you where the alarm originated. In case of an alarm, Vigilant Security Inc. will call the Lodge and let the phone ring six (6) times. If you answer within the six (6) rings and tell the Vigilant operator there is no emergency, Vigilant will take no further action. If you do not answer within the six (6) rings, the local fire department will be summoned. When you want to silence the alarm, press the “SILENCE” button. Clear the reason the system went into alarm (smoke, dust, steam etc.) then press the “RESET” button. Sweep all rooms occupied, including the porch. Clean, dry and put away all dishes, pots and pans. Wipe down all counter tops, stove and tables. Clean out refrigerator; Do not leave behind any perishables, take leftovers with you. Clean up food spills in refrigerator. Clean all food from stovetop and oven. Fireplace – remove ashes and place in appropriate receptacle. Grill – remove ashes and place in appropriate receptacle. Reset thermostat to 58 to 60 degrees. Thermostat is located in the bedroom hall on first floor. During heating season – please check the gauge on the oil tank in the basement and inform the Office of Conferences & Events if the oil level is at three-eight’s or below. 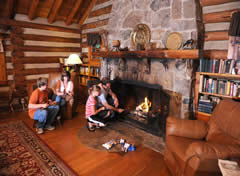 Please let Conferences and Events know when more firewood is needed at the Lodge. If the gate is locked upon arrival, lock it again when you leave. Return keys to the Office of Conferences & Events or to the Information Desk at Ellis Hall. Individuals/Groups that do not comply with the above policies will be fined. Fire: Fire extinguishers are provided. Call 911. You are in West Township, by Camp Blue Diamond. Fishing is catch and release. Beach is private. Blue Diamond Lake is not available for swimming, sand volleyball, or boating. This is a private lake for Camp Blue Diamond guests only. No exceptions are made. Please do not use West Pond for recreation. It is privately owned and is not part of Juniata College property.